When and where Graeme Smith was born? Graeme Craig Smith (born 1 February 1981) is a former South African cricketer, who played for South Africa in all formats. In 2003, he was appointed captain of the national team, taking over from Shaun Pollock. He held the position of test captain until his retirement in 2014. A tall, left-handed opening batsman, Smith is regarded as one of the best test match openers of all time. South Africa never lost a test match in which Smith scored a hundred or more. On the 2003 South African tour of England, he made double centuries in consecutive Test matches: 277 at Edgbaston, and 259 at Lord's. The 259 is the highest score made at Lord's by a foreign player. On 24 October 2013, Smith became the second South African and 12th overall to complete 9,000 runs in test cricket in his 112th test match. Known for the success of his opening partnership with Herschelle Gibbs, South Africa's most prolific ever opening partnership, Smith has the distinction of having been part of all four of South Africa's opening partnerships of over 300 runs: in three of them he was partnered by Gibbs, and in 2008 Smith added 415 for the first wicket with Neil McKenzie against Bangladesh, a world record opening partnership. On 3 March 2014, during the third Test against Australia, he announced his retirement from international cricket. 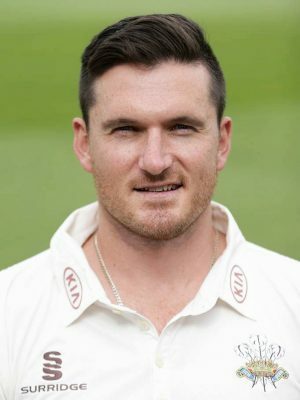 How tall and how much weigh Graeme Smith?